Alberto Santos-Dumont was a Brazilian aviation pioneer, deemed the Father of Aviation by his countrymen. Alberto Santos Dumont was born July 20, 1873, in the village of Cabangu, State of Minas Gerais, Brazil. At the age of 18, Santos Dumont was sent by his father to Paris where he devoted his time to the study of chemistry, physics, astronomy and mechanics. 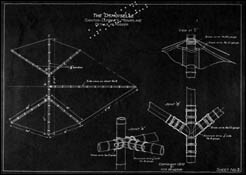 His first spherical balloon, "Brasil," ordered from Maison LaChambre, with the capacity of 113 cubic meters, capable of lifting a ballast of 114.4 lbs, and having in its lower part a wicker basket, made its first ascension in Paris on July 4th, 1898. His second balloon, "America," had 500 cubic meters of capacity and gave Santos Dumont the Aero Club of Paris award to study the atmospheric currents. Twelve balloons had participated in this competition but "America" reached a greater altitude and remained in the air for 22 hours. Putting aside the aerostation, he began to devote himself towards solving the problem of steering the balloons. His first steered balloon, "Santos Dumont no. 1," ascended on September 18th 1898. Balloons "Santos Dumont no. 2," which wasnt successful, and "Santos Dumont no. 3," built at the Vaugurand workshop, followed. "Santos Dumont no. 3" ascended on November 13th, 1890. It circled a few times the Eiffel Tower, headed to the Park and from there finally headed towards the Bagatelle field where it landed flawlessly. In view of the success of no. 3 balloon, the Aero Club of France was founded and Mr. Deutsch de La Meurt instituted the "Deutsch Prize" to be awarded to the balloonist who, taking off from Saint-Cloud, circumnavigated the Eiffel Tower and returned to the starting point in less than thirty minutes. This prize was conquered by Santos Dumont on October 19th, 1901, with dirigible no. 6. Besides this prize, Santos Dumont received the sum of 100,000 francs which he distributed in equal parts to his workers and the beggars of Paris. Dirigibles nos. 7, 8, and 9 followed. With the latter, on July 4th, 1903, Santos Dumont maneuvered over Longchamps, where a military parade was being held in commemoration of Bastille capture. Once he solved the problem of steering the lighter-than-air vehicle, Santos Dumont devoted himself to the heavier-than-air problem. Aboard the 14-BIS he made his first unsuccessfull attempt in July, 1906. On September 7th, the 14-BIS wheels left the ground for a moment; on the 13th it could reach the height of one meter; on October 23rd, the airplane flew 50 meters. It was on November 12th, 1906 that Santos Dumonts airplane, the 14-BIS, flew a distance of 220 meters at the height of 6 meters and at the speed of 37,358 km/h. Thanks to this flight the "Archdecon Prize" was awarded to Santos Dumont, who had thus, solved the problem of making a heavier-than-air machine take off by its own means. Santos Dumont died on July 23rd, 1932, in Brazil. According to the law no. 165 of December 5th, 1947, enacted by the National Congress of Brazil and sanctioned by His Excellency President Eurico Gaspar Dutra, Alberto Santos Dumont was permanently listed in the Brazilian Air Ministry Almanac with the rank of Lieutenant Brigadier. He was promoted to the Honorary rank of Air Marshall on September 22, 1955, according to the law no. 3636, and is permanently listed in the Brazilian Air Ministry Almanac. In October of 1900, Santos-Dumonts dirigible made the first flight around the Eiffel Tower. Among the Memorabilia of Santos Dumont being presented by Mrs. Machado to the Smithsonian Institution, there are 2 models of the 12-BIS airplane. Following is the description of the 14-BIS as taken from the Official List of Records of the "Aero Club of France": Span; 40 feet, Length; 33 feet, Surface; 860 sq. feet, Weight; 352 pounds, Engine; Antoinette, 24 HP. First official flight of Santos-Dumont in a heavier-than-air machine taking off by its own means: 7 meters of distance at 70 cm. above the ground in Bagatelle (Paris) on Sept., 13, 1906; On October 23, 1906, another official flight, covering 60 meters (200 ft.). On November 12, 1906, in Bagatelle, Santos-Dumont covered 220 meters (770 ft.) in 21 seconds and 2/3. This flight established the first world aviation record.